I'm from Ghana and I want to know whether receiving a scholarship at a competitive school is easy or difficult. Most high-ranking schools also have top-notch financial aid programs. But though many of these colleges pledge to meet 100 percent of demonstrated need, that term can mean very different things to different schools. Harvard, for example, ranked first on the US News and World Report list of best value universities, costing an average $15,486 for students on financial aid, after need-based grants are factored in. That's about $5,000 cheaper than Columbia, which came sixth on the list, and $10,000 cheaper than Georgetown, which ranked 24th. Harvard has one of the best financial aid systems in the country. Although they do not offer merit, athletic, or academic scholarships, they have an extensive need-based financial aid system. Application to the college is need-blind, and Harvard claims on its financial aid website that they meet the demonstrated financial need of every student, including international students. 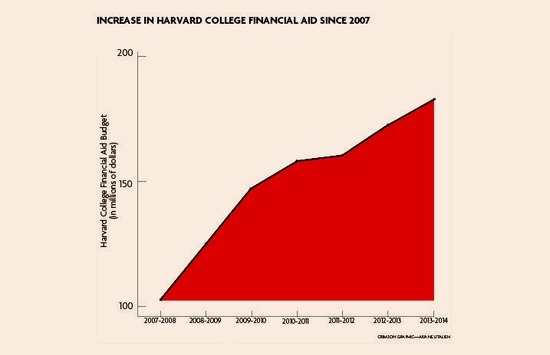 The idea behind this policy is that financial need should not deter potential students from a Harvard education. As previously stated, the average cost for students on financial aid is $15,486, and 59.5 percent of students receive some form of aid. Find out more. Yale has a very similar policy to Harvard: Applications are need-blind for both domestic and international applicants. Again, there are no merit, athletic, or academic scholarships available. 54 percent of Yale students receive financial aid, and the average after-aid price is $16,205. Learn more. Princeton's financial aid program has grown dramatically since 2001. In this time, their funding for the need-based financial aid program has grown by over 150 percent, while tuition costs have only risen 47 percent. 58.9 percent of Princeton students are receiving some sort of need-based financial aid, and Princeton explicitly states that their financial aid program also covers international students. Princeton's admissions are need-blind, and their financial aid package even takes into consideration the cost of "eating clubs." The average cost for students on financial aid is $17,614. According to Brown's financial aid program, 46 percent of the class of 2016 received need-based scholarships. However, these scholarships included federal and state need-based scholarships as well—42 percent receive need-based aid from the college. Again, admissions is always need-blind—a policy that was introduced at Brown in 2007. For students on financial aid, Brown's average cost is $22,039. Columbia has an office of financial aid and educational financing that works with families of students to not only apply for Columbia need-based financial aid but also for federal and state grants. They also offer student loans. Columbia is need-blind for U.S. citizens, residents, and refugees living in the U.S., as well as for transfer students. However, Columbia admissions are not need-blind for international students. 49.9 percent of students receive aid, and the average price for them is $20,435. Cornell also has a need-based financial aid program, but though admissions is need-blind, international students only receive aid on a “limited” basis, according to their website. 47.7 percent of Cornell students receive aid, and their average cost is $21,849. At Dartmouth, admissions is need-blind, and students who come from families with total incomes of less than $100,000 receive free tuition at the school with no loans. Financial aid at Dartmouth also extends to any Dartmouth study abroad program. 49.7 percent of Dartmouth students receive aid, and the average cost for those students is $21,587. Penn, similar to Columbia, offers need-blind admissions to citizens and permanent residents of U.S., Canada and Mexico, but not for international students. However, those students can still apply for financial aid if they get in, though they are encouraged not to if their family can bear the cost themselves. Penn awards $6 million in need-based financial aid annually under a no-loan policy. 44.2 percent of Penn students are on financial aid, bringing the cost for them down to an average $23,552 after financial aid. Learn more. Stanford has similar need-blind admission policies as Columbia and Penn, stating that they admit only a small number of international students with financial need annually. The average cost for students receiving aid (49.7 percent of the class) is $18,593. For more information, see here. Caltech has need-blind admissions for U.S. citizens and permanent residents only. They also have substantial financial aid for international students. 52.4 percent of students are on financial aid, and the price for them averages out to $21,551. Schools in the University of California system—such as UCLA and UC Berkeley—offer need-based financial aid for students who qualify. In addition, the UC system as well as individual UC campuses offer scholarships based on merit and financial need. For example, UCLA has an extensive list of scholarships available, either based on merit and financial need or based on the specific niche the student would be filling in the school—studying humanities and law, for example, qualifies students for the Angelina Ruggie Scholarship Fund. Find out more about UCLA's scholarships. Williams has a needs-blind admissions policy for domestic applicants only. It promises to meet all demonstrated need of domestic applicants and guarantees no-loan financial aid packages for students whose families make under $75,000 a year. The average cost for students after financial aid is $19,251. Amherst, another well-respected liberal arts school, just recently extended its needs-blind policy to international students as well as domestic ones. While Amherst claims to meet all demonstrated financial need and does not include loans in their initial financial aid offers, some students do require loans to afford tuition. The average cost for students on aid, who make up 55 percent of the student body, is $16,286. What is the lowest score an admitted student got on the SAT? According to The Crimson’s freshman survey for the class of 2017, the lowest self-reported SAT score for a member of Harvard's Class of 2017 was a 1660, almost 600 points below the average score of 2237. According to that same survey, the lowest self-reported high school GPA (on a 4-point scale) was a 3.0, with the average being a 3.94. If I ask a question, will my name be public? No! Everything is anonymous, so please feel free to ask us anything about the admissions process.